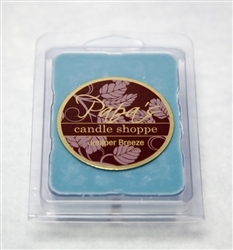 This one is a refreshing scent of forest greens, jasmine, green apple and musk. Buy Six and pay only $3.33 each. Did not like the scent. Too overpowering. To me, these melts smell just like the Bath & Body Works retired Juniper Breeze fragrance which is what I was looking for. Very strong scent.